Morocco’s government says the country’s navy opened fire on a boat suspected of carrying migrants, wounding four. The Moroccan Interior Ministry says that a naval unit operating in the Mediterranean fired on the boat because its Spanish captain refused to respond to warnings. The Interior Ministry said the boat was illegally transporting migrants. The boat was seized and an investigation opened. MAP said the four people injured were taken to the provincial hospital in the M’diq-Fnideq region. Regional authorities didn’t immediately respond to requests for further details. It was the second time in recent days that Morocco’s Royal Navy intervened to stop a boat suspected of carrying migrants across the Mediterranean, and comes amid growing concerns about migrant trafficking in the western Mediterranean region. A Spanish official says Spain, France, Portugal, Germany and Malta have reached an agreement to distribute between them the 58 migrants aboard a rescue ship stranded in the Mediterranean Sea. An official at the Spanish prime minister’s office, who was not authorized to be named in media reports, said Tuesday that all the migrants from the Aquarius 2 will disembark in Malta, and that Spain will take 15 of the passengers. The official provided no further details of the agreement. Earlier, Portugal had said it would take 10 of the migrants. The private rescue ship is operated by the humanitarian groups Medecins Sans Frontieres and SOS Mediterranee. The flow of migrants from North Africa across the Mediterranean has caused deep social and political divisions in Europe over how to share the burden. Portugal’s government says it is taking in 10 of the 58 migrants aboard a rescue ship in the Mediterranean Sea, as part of a deal with France and Spain. Authorities in Paris and Madrid made no immediate announcement about a possible deal on what to do with the other people on the Aquarius 2 rescue vessel. The ship asked France on Monday to let the migrants disembark in Marseille, but Paris said there were closer ports and a need for a comprehensive European solution to the migrant problem. Portugal said it also sought a “stable, permanent” response to rescued migrants coming from North Africa. Croatian police say they have detained two migrants from Syria for hijacking an empty a bus. Police say the bus was stolen from a village near the Bosnian border early on Tuesday before police spotted it on a nearby road and followed it. In a statement, police said the bus stopped after a while and the two men jumped out and tried to run away. The bus then rolled backward before hitting the police car. No one was injured. Over the past few years, a number of migrants have entered Croatia, a European Union member, from Bosnia before attempting to move toward Western Europe. The European Union says it is not legally responsible for dealing with an NGO rescue ship in the Mediterranean Sea with 58 migrants aboard and has not been asked to help find safe harbor for the vessel. In a tweet earlier, the humanitarian group Medecins Sans Frontieres, which jointly operates the ship the Aquarius 2, said the vessel was headed north toward France. A rescue vessel carrying 58 migrants pulled from the Mediterranean north of Libya is heading toward France and an uncertain welcome. On Monday, the ship asked French authorities to let the migrants disembark in the southern city of Marseille. France deflected the request, saying there were closer ports and a need for a European solution. Humanitarian boats loaded with rescued migrants are increasingly shunted between European governments under political pressure to stem newcomers. The EU has trained Libya’s coast guard in sea rescues, but aid groups say Libya in no way meets the definition of a safe harbor. 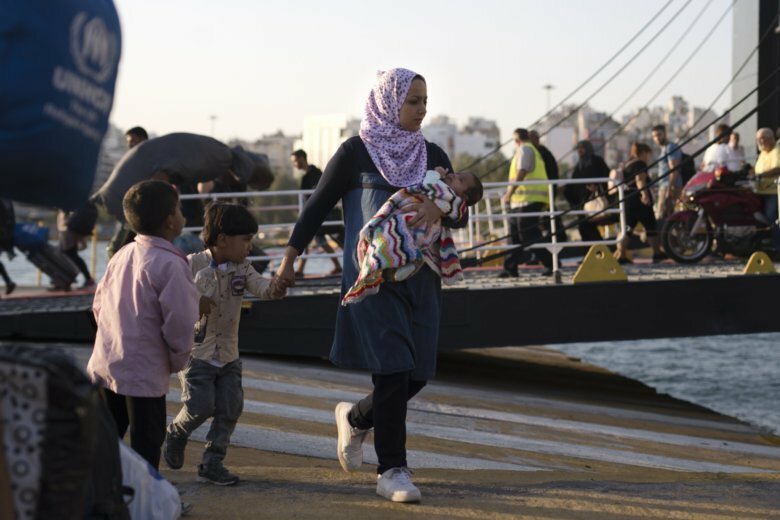 About 400 asylum-seekers who had been held in the severely overcrowded Moria migrant camp on the Greek island of Lesbos have arrived in Greece’s main port of Piraeus to be transferred to other camps and residences on the mainland. The asylum-seekers, mainly families from Syria, Afghanistan and African countries, arrived Tuesday onboard an overnight ferry from Lesbos. They are among around 2,000 people whom the government has pledged to move out of Moria, a facility built for 3,100 people but which is at nearly three times capacity. Charities have slammed conditions in the camp, citing cases of sexual attack, deplorable sanitation and an increase in suicide attempts among residents. The local regional governor has threatened to shut the facility unless the government improves conditions.